St. Mary Parish was founded in 1853 to serve Irish and German immigrants working in the textile mills in the west end of Providence. 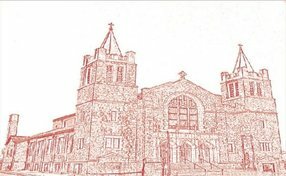 After Eleven years, the parish began work on a larger, more permanent Church on the corner of Broadway and Barton Street in Providence. Built out of granite from the quarries in Westerly, RI, it was completed in 1869 and is still in use to this day. Between the years of 2005 to 2011, the parish became more of an intentional than a territorial parish. Today, parishioners come from all over the area to worship along with eclectic population of Broadway. 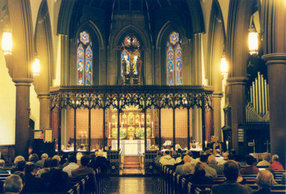 The parish is also the home of the only Catholic Korean community in the Diocese of Providence. The Parish community is energetic, creative and very welcoming. In addition to the working poor who live in the area, the West End of Providence is also a residence for graduate students, young urban adults (hipsters) as well as young professionals. The parish strives to live up to it's motto, "All are welcome." All are welcome is not merely a motto; it is an expression of our mission. Go here? Tell us why you love St. Mary. Visited? Tell us what a newcomer can expect. Enter your email address to receive an informative welcome email from St. Mary.